Sign up for Broadjam today to follow Shareefah C. Abdullah, and be notified when they upload new stuff or update their news! 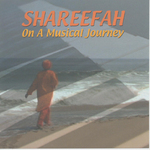 Reviewer J-Sin of Smother.net wrote: "Shareefah writes solo adult contemporary and new age funky jazz fusions that will delight the heart and mind alike. Her compositions are bouncy and light allowing the shiny elements of hip funk to perpetuate the mix, creating a unique flow." Her fans describe her music as that which provides positive energy and soothes the soul. Little catepillars were getting into my kitchen. when I told my brother Charlie about them, he urged me not to kill them but to put them on the patio because they would become butterflies on day. I wanted to write a tune that gave people the sense of being on an exotic vacation. I envisioned a beautiful night in Spain overlooking the water.